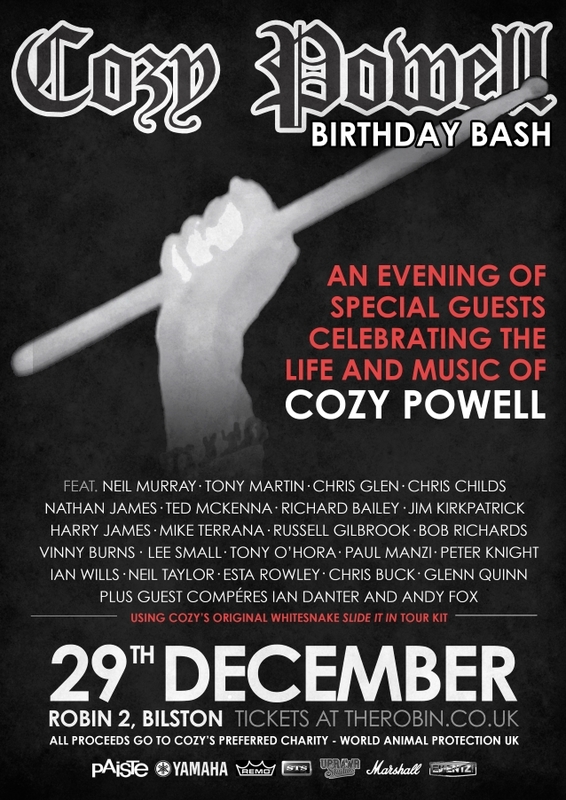 A special concert celebrating the life and music of legendary rock drummer Cozy Powell was held on December 29, 2018 at Robin 2 in Bilston, West Midlands, England. All profits from the event — which took place on what would have been Powell's 71st birthday — are being donated to Cozy's favorite charity, World Animal Protection. Among the musicians that appeared at the event were URIAH HEEP's Russell Gilbrook, CATS IN SPACE frontman Paul Manzi, Mike Terrana, THE SWEET's Tony O'Hora, THUNDER's Chris Childs and Harry James, MICHAEL SCHENKER GROUP members Chris Glen and Ted McKenna, DARE guitarist Vinny Burns, LIONHEART's Lee Small, former WHITESNAKE and BLACK SABBATH bassist Neil Murray, and ex-BLACK SABBATH singer Tony Martin. Cozy's original drum kit was used throughout the night. Powell's resume reads like a classic rock bible: COZY POWELL'S HAMMER, THE JEFF BECK GROUP, RAINBOW, MICHAEL SCHENKER GROUP, WHITESNAKE, EMERSON, LAKE & POWELL, BLACK SABBATH and many, many more.